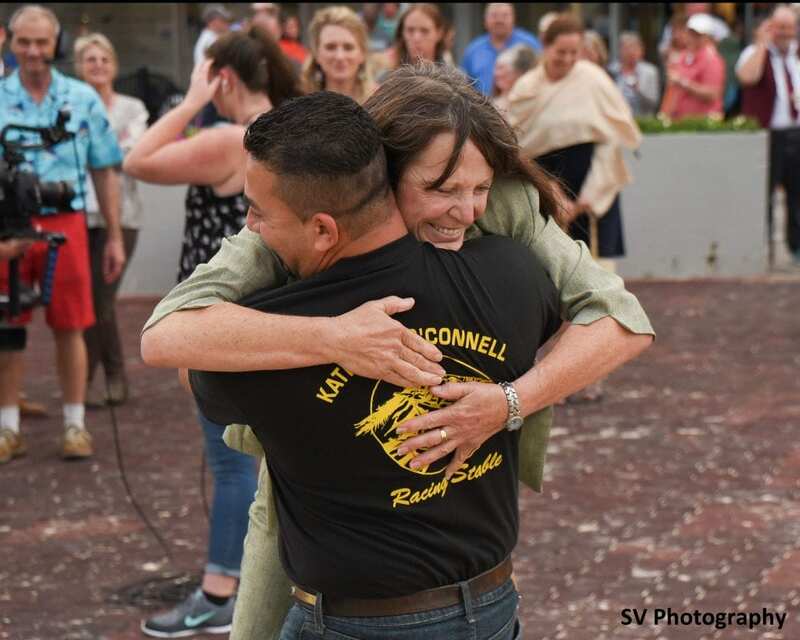 The celebration at the Kathleen O'Connell Racing Stables barn was relatively subdued after Saturday's Grade III, $250,000 Sam F. Davis Stakes victory by Well Defined at Tampa Bay Downs. But it continued into Sunday afternoon, as well-wishers paid heartfelt tribute to the 3-year-old Florida-bred gelding, his trainer and her staff. Paula Bacon, the agent for winning jockey Pablo Morales, bought a case of cool ones for everyone to toast the winner Saturday night. O'Connell enjoyed a glass of wine at home and prepared for a typical pre-dawn arrival to supervise the next morning's activities. One of O'Connell's owners, Joe DiBello, bought steaks for an afternoon cookout. “I think he had a ticket on (Well Defined),” O'Connell said with a sly smile. Any time a locally-based outfit wins a major stakes, the result is enjoyed throughout the barn area by the track's rank-and-file owners, trainers, grooms, hot walkers and exercise riders, who know how difficult it is just to get a horse to a big-money race. In the case of O'Connell, who first arrived at Tampa Bay Downs in 1976 as a gallop person when women were not universally accepted on the backside and started her own stable in 1981, the feelings are especially heartfelt. Throughout the day, she felt the presence of her late parents, Joseph and Arlene, who died within a recent three-month span after being married 68 years. But there were no bittersweet feelings in the winner's circle as O'Connell and her crew exulted. “Yesterday was special because it was at Tampa and I've been at this track every year since 1976,” said O'Connell, whose first racetrack license from Detroit Race Course in 1970 stated her occupation as “Pony Boy.” She first went to the racetrack when her application for Michigan State's veterinary school was turned down despite her 3.8 grade-point average and four years of 4-H experience. “When I came here, I could see the writing on the wall as far as Michigan racing not moving forward, plus I'd had pneumonia three times. I moved here (permanently) in 1984 because it was such a good place to train and live, so it's like this is home,” she said. O'Connell reported that Well Defined came out of the race in good shape and will be shipped back to his Gulfstream Park West base in the next day or two. “His group is there; Sebastian Madrid is his regular exercise rider, and Jose Gutierrez, who has worked for me for 18 years, is his regular breeze rider,” she said, “so it's just been a big team effort. Well Defined earned 10 “Road to the Kentucky Derby” qualifying points. O'Connell's lone Kentucky Derby starter to date is 2011 Grade II Tampa Bay Derby winner Watch Me Go. The addition of blinkers Saturday appeared to give Well Defined the focus to follow Morales' cues to perfection, sprint smartly to the lead at the outset and keep his mind on the business of winning throughout the mile-and-a-sixteenth event. “He's a little on the immature side, and I had even thought about blinkers before he ran his first race just to try to get him focused,” O'Connell said. “I figured (the Sam F. Davis) was time, and I think the blinkers and Pablo getting him out of the gate and in good position were big factors. “I told Pablo before the race it wasn't like he had to be in front, but he did have to be forwardly placed. It brought back visions of the $400,000 (Florida Thoroughbred Breeders' and Owners' Association) Florida Sire In Reality Stakes he won at Gulfstream (by 7 ½ lengths, on Sept. 29),” she said. O'Connell said she would discuss Well Defined's next start with owners Gilbert and Marilyn Campbell; local fans are keeping their fingers crossed it will be in the Grade II, $400,000 Lambholm South Tampa Bay Derby on March 9. Like Watch Me Go and a number of other talented O'Connell-trained stakes winners – Blazing Sword, Ivanavinalot, Scandalous Act and Fly by Phil, to name a few – Well Defined is a product of long-time client Gilbert Campbell's Florida breeding program (Well Defined competes under Campbell and wife Marilyn's Stonehedge, LLC banner). “It's a tremendous testament to Mr. Campbell's influence and his program, and I couldn't be happier for them,” O'Connell said. “He has put a lot into the business over the years, and he's a very patient owner. If a horse needs time, they get time. It's good to have a rapport with your owners where you can discuss what races would fit them best. This entry was posted in NL List, Triple Crown and tagged Gilbert Campbell, gulfstream park west, kathleen o'connell, marilyn campbell, pablo morales, paula bacon, road to the kentucky derby, sam davis, Sam F. Davis, well defined by Press Release. Bookmark the permalink.